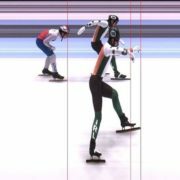 Ryan McAnuff (24) and Sean McAnuff (21) became the first Irish ice skaters to compete in the same category at an International Skating Union (ISU) Championships this weekend in front of capacity crowds at the European Short Track Speed Skating Championships in Dordrecht, Netherlands. The brothers raced over the course of three days in the 500, 1000 and 1500 metre distances. The best performance on a gruelling opening qualification day was by Sean who finished in third place in the 1000 metres and just missed out on advancing to the quarterfinals. The highlights of the event came on Day Two. Ryan smashed his own Irish 1500 metres national record by four seconds in coming third in his ranking final in a time of 2:14.413. It was the 12th best time in the distance. The siblings were found themselves in the same 500 metres ranking final and, despite a broken blade and a subsequent restart, Sean pipped his older brother for an Irish 1-2. Day Three saw them conclude their racing by coming second in each of their respective 1000 metre ranking finals. The overall championships classification saw Sean finish 31st and Ryan 36th to maintain two spots for next year’s event.